If you are an active user of Youtube and Orkut, then you can easily share Youtube activities with Orkut buddies. You can setup and link your Orkut profile with Youtube account to automatically publish updates on Orkut. You can auto post Youtube activity updates on Orkut related to: Youtube videos you watch, like, comment, Youtube video channel you susbscribe and videos you upload on Youtube. 1. Login into your Youtube account & goto Activity Sharing tab. 2. Then click on Orkut button to link your Orkut profile with Youtube account. You can also click to select which type of Youtube activity updates you want to post on Orkut among options: like a video, comment on a video, subscribe to a channel, favorite a video and upload a video. One easy and quick way to keep Orkut friends updated on your Youtube activities. [via Orkut blog]. 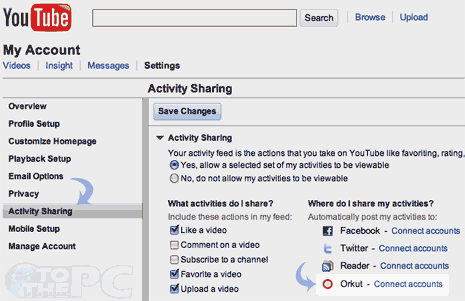 Similarly, you can share Youtube updates on Twitter & Facebook profiles.